Former French horse Avilius has continued to thrive in Australia, notching his third win from three starts for Godolphin. After three starts in Australia for three wins, former French horse Avilius is a firm favourite to win a Group One race at his next start after blitzing his rivals in the Kingston Town Stakes at Randwick. 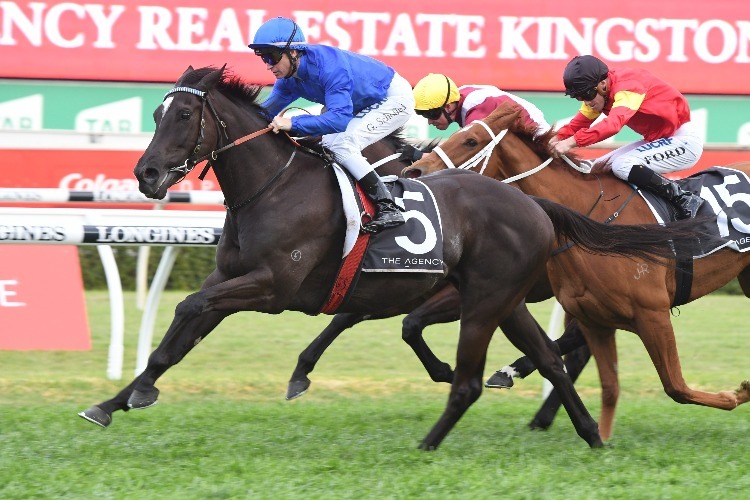 The Godolphin-owned five-year-old earned favouritism for Saturday's Group Three race over 1 1⁄4 m with his wins in a benchmark race and the Premier's Cup. He firmed from $4 to $2.80 for the Metropolitan Handicap (2400m) in two weeks when he came out of the pack to motor home three-quarters of a length to the better of Brimham Rocks ($8). "He has been a breath of fresh air this horse," Godolphin representative Darren Beadman said. "He is certainly a proper horse." "Glyn (Schofield) rode him a very confident race,. "He put him to sleep and when he popped him off at the half mile and got on the back of One Foot In Heaven , got a nice tow into the race. "He can't be penalised for the Metropolitan or the Cups because of the set weights and penalties for this race. "At the moment the world is his oyster and he is a horse with a bright future." Avilius firmed to $8 for the Caulfield Cup and $17 for the Melbourne Cup after the win which Schofield said was another feather in his cap. "He has announced his arrival in the country with a good start to his career and today was another feather in his cap," he said. "He was a fair way back in the run but it was run pretty solidly and I was fortunate enough to get him to the outside and allow him to use that speed that he has got. "It's very nice to see on a dry track with a testing tempo that he still had that turn of speed. It was a good all round performance."